Dana 28 and 35's use a "C" clip to secure the drivers front axle. I wasted mine today during the reassembly. Where can I find another? I ordered some from Ford but I need them now, Will a generic clip work? Just eliminate it. C-clip Eliminator Honestly its probably the best decision. You mean the one behind the hubs or the one inside the differential. The one behind the hubs can be found at almost any junkyard. So can the other, but it a lot more involved to get to. The one inside the diff. I'm not convinced that's a good fix or not. Anyone here doing it? Alot of guys are running that here, just think how easy replacing that center u joint will be! Lots of people have done it, don't want to pull the pig to remove the clip if you bust that shaft do ya? I'll be doing that when I get the Lock-Right up front in mine. Seems like if you tack the backside of the cap, you should be good to go. If you have alot of flex the internal spring does not work well. Run and external spring and everything will be fine. maybe trs fab can be convinced to offer those external springs for the d28 and d35 eliminator? That would be nice. I also want to see a picture. 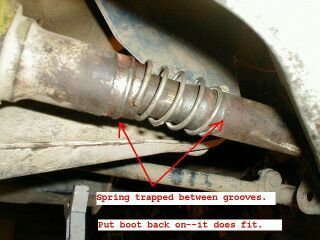 I use this on mine also (hose clamps used to secure the boot also secure the spring). Spring needs to be 2.5-3" long, 1-3/8" I.D., and rated around 20-30 lbs-in. As was mentioned, internal springs leave little room in there for the shaft to move when the suspension droops (which can bust the dust cap out of the axle yoke). I used the external spring like Junkie, seems to work just fine. Just take time and use some sense to get the tension correct so you don't have excessive pressure on anything.